This was my first Italian fountain pen. I remember the day, I was at Novelli Pen in Rome, and when Marco brought out this pen, well, nothing more to say. Delta-Chatterley Pen, Delta Fusion Star line of pens, Circo Matte. One of my more recent additions. A stunning pen, and this has a matt or non buffed finsihed. The colours really come out and it has a nice feel in the hand. Another of the Delta-Chatterley line of pens, the Tidal Pool. Resin body with incredible colours. Piston fill, and fitted with a smooth Fusion Stub Nib. Montegrappa Espressione, in Red. A large red pen... can I say anymore, with a very smooth 18kt gold nib. 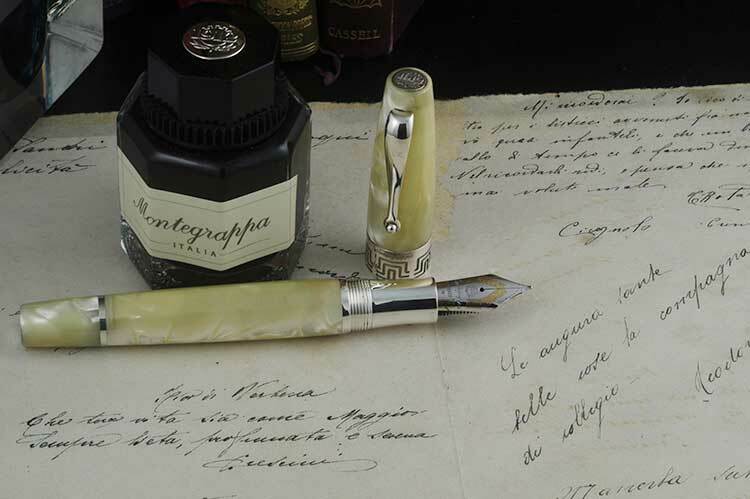 Montegrappa Extra 1930, Marble Green. I love this pen so much I am afraid to take it to work! The OMAS 360 Vintage series was a hit with me. This one, the last of the series is called the Fume, Smoke Black. The classic Arte Italianna line of pens. Celluloid, beautiful colours, light to hold, smooth nib. Nothing more you want in a fountain pen. 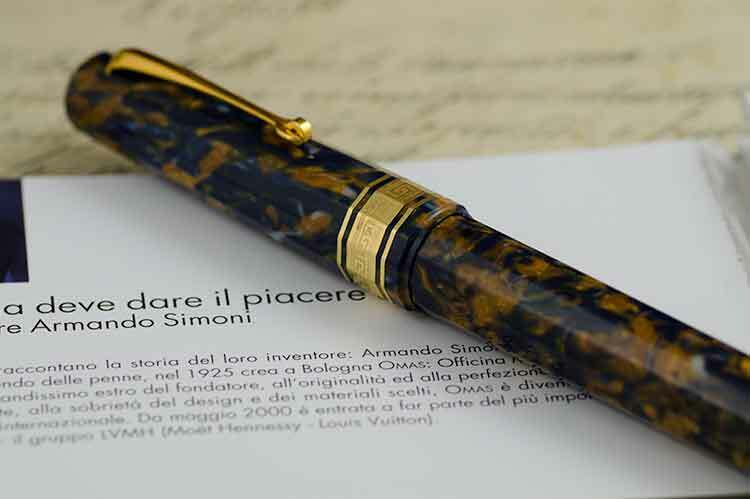 This is one of the iconic Italian fountain pens. I have two Tantelum pens, one with an italic nib and one with a broad. 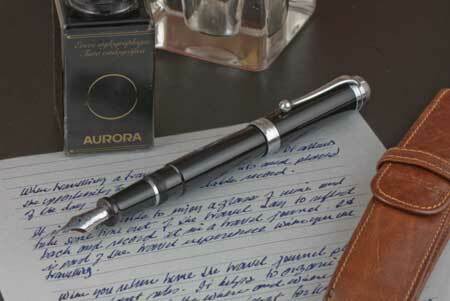 This is a comfortable pen in the hand and has the feel of a well made writing instrument. One was not enough. 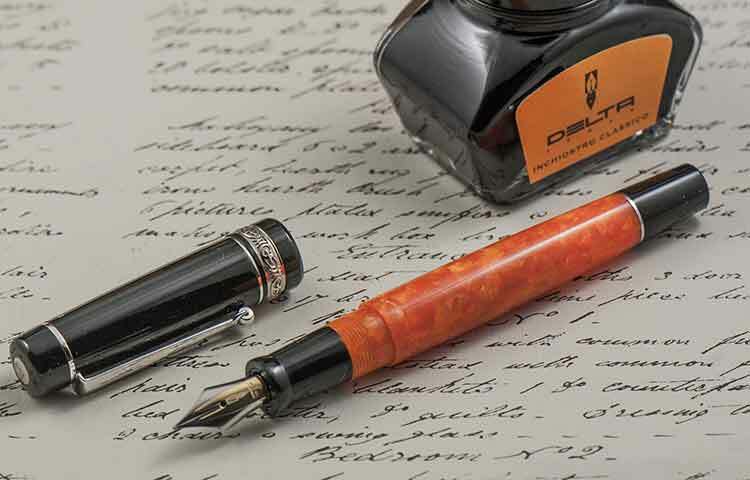 The Delta Dolcevita is one of the iconic Italiian fountain pens of Italy. The warm orange refledts the warm of culture of the country. How I like the design and linkage to history of the pens produced by the major Italian pen companies: Aurora, Delta, Montegrappa, OMAS, Stipula and Visconti. It all started with my first Italian beauty, the Montegrappa Extra 1930 Parchment (See my Pens of Note). I can remember the day very clearly. I was in Rome, at Novelli Pen, and Marco showed me this pen as something that may interest me. Sure did. That seem to start the addiction! What a beautiful while celluloid pen with sterling silver trim. It is one of the few pens with a medium nib that I have, but I enjoy writing with it and I always receive comments on the pen as for me, the colour is very different from the other pens I own. Delta, a "young" company. I first visited the Delta headquarters, which are located just outside of Naples, in 2012. My wife Karen and I will be returning for another visit in September 2014. 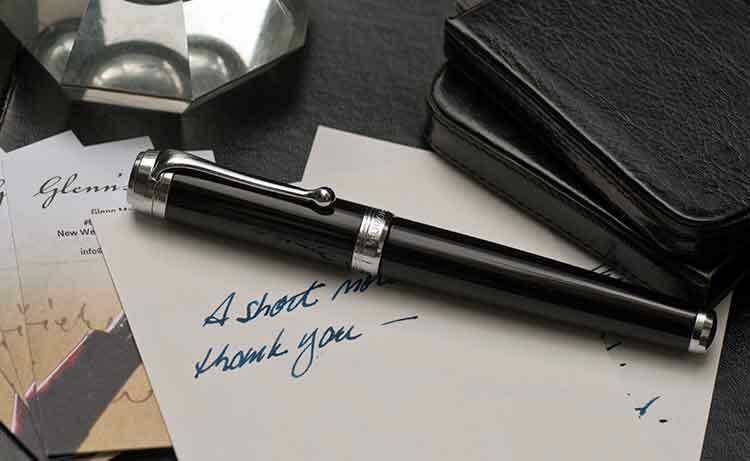 We both enjoyed our time there, were treated so nicely, and I must admit, I am a big fan of Delta fountain pens. Nino Marino, Ciro Matrone and Mario Muscente formed a parnership and founded Delta in 1982. Since then the company has been producing high quality pens that reflect good style and has the quality of workmanship expected of an Italian pen. Right: The Journal, resin body, available with a steel or Fusion nib. See Great Pens. Delta created the classic Dolcevita (see Pens of Note) which I view as an Italian iconic pen. It just says Italy. The bold orange is the warmth of the country. In 2012, I visited Delta as they were just getting ready to launch the new Fusion Nib. This is a new technology where steel and 18kt gold are fused together. I have become a big fan of the Fusion nib, especially the Stub version and from having just one pen with a Fusion nib in 2012 now have over six Delta Dolcevita bodies each fitted with the smooth nibs. I was impressed with the amount of hand hand work that I saw when in the Delta factory. They also told me they produce pens in small quantities. Little did I know I would just have to have a number of the Dolcevita pens made by Delta for Chatterley Pen. They created small numbers, 10 and 18 of a particular resin or celluloid. 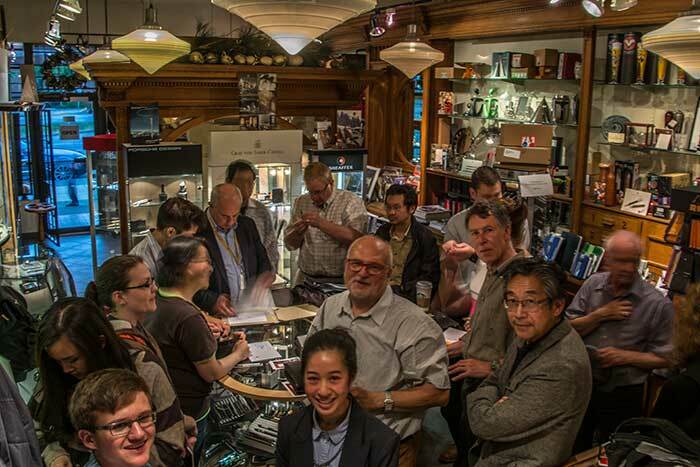 The Vancouver Pen Club, and in collaboration with Delta Pen, had at the pen talk a range of promotional material and fountains pens. At the talk I showed the group the somewhat unique "The Journal" fountain pen. Maja Furlong was presented with a Dolcevita Slim fountain pen (no photo), and Pete Ha (on left) the Delta The Journal, fitted with a very smooth writing steel nib, and Jeff Stacy (on right) The Journal fitted with the Fusion 18kt gold nib, another very smooth writing pen. 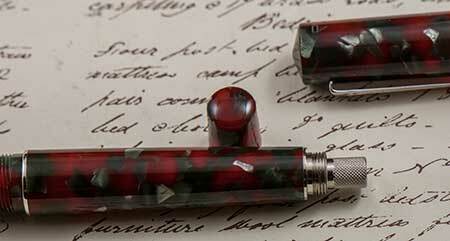 The Journal is a beautiful pen, made from a solid bar of resin. Fitted with a steel or 18 kt gold Fusion nib, both pens demonstrate the smooth writing characteristics that Delta strives for in their products. The pen has a different type of ink filling system. Screw off the blind cap at the end, and the twist mechanism of a piston comes to view. Turn it and the pen draws up ink. But it is not the top of a piston, but rather the top of a converter. No need to unscrew the body and hold the pen by the converter to fill the pen. Just hold the pen. Much easier. Good idea Delta! Founded in Turin, 1919, just after the end of the World War I, by Isaia Levi who was a rich fabric merchant bringing his industrial and commercial expertise to the company. The name Aurora, the dawn, was chosen to represent the beginning of new things. Since that time the company has lived to that expectation, never forgetting its roots and the passion of the its history and country. Aurora was the first pen company that I visited, back in 2006. I did correspond with Aurora as I prepared for my talk, and I hope to return to Torino soon and visit the company again. Right: Aurora Talentum and very comfortable pen to hold, and with good classic style. Like the the other Italian pen companies, Aurora has its own design department and I recall them talking with me about the creation of a new pens starts more than two years in advance from when see the pen in a store. The company is so connected with the history and culture of Italy. 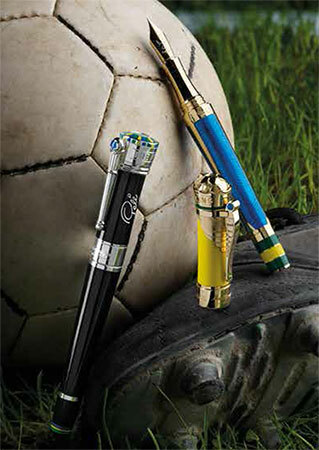 It is from Italy's history and culture that the designs and concepts come from to create the various lines of pens. The Aurora's 88 represents one of Aurora's true classics. Design by Marcello Nizzoil, the pen has been in production since 1947 more than a million pens have been produced. 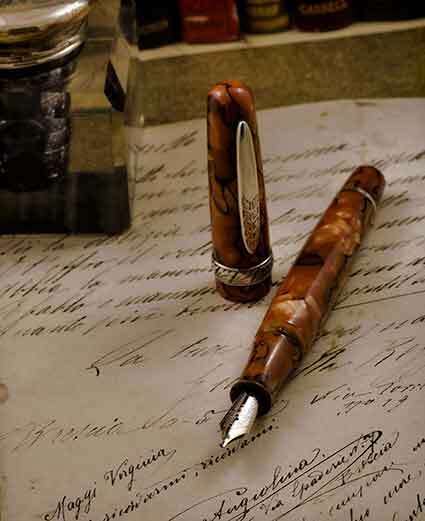 It is often referred to as the most famous Italian fountain pen. The HASTIL pen, a thin ball point pen was the first pen to be displayed at the New York Museum of Modern Art was designed by Marrco Zanuso. Hard to find in Canada, Aurora makes beautiful leather accessories. When I was at Aurora, they brought out a box with a pens fitted with all the variations of nibs. 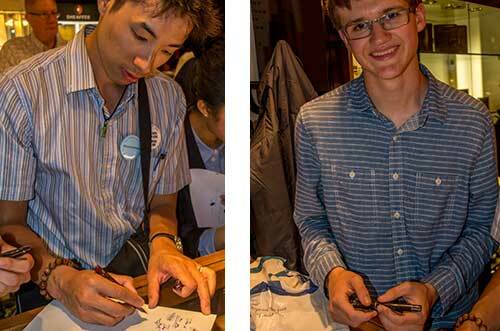 It was a great experience to sit and write with all the various pen variations. 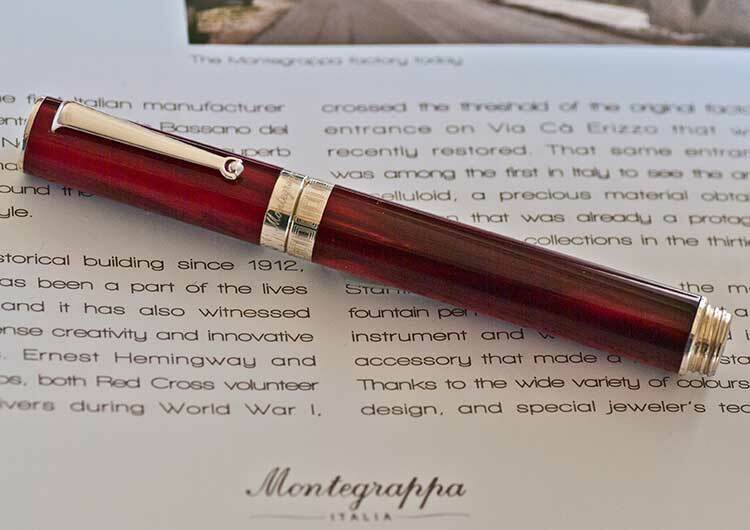 Montegrappa is another leading Italian pen manufacturer with a rich history. 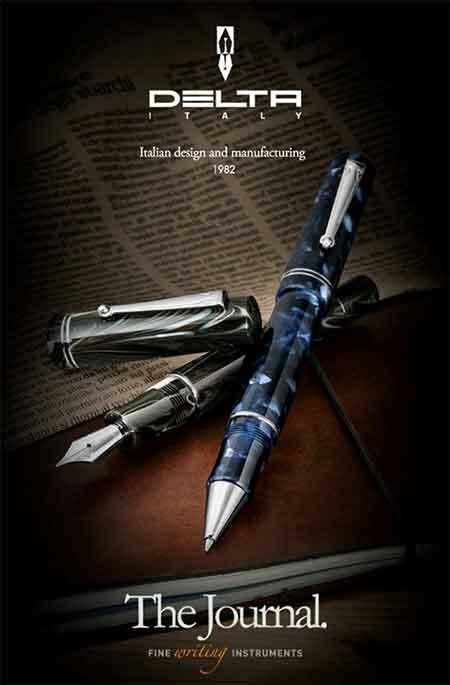 My first Italian pen is a Montegrappa, so I hold this company is special regard. The company is a privately-owned company, their product lines have expanded from writing instruments to include other life-style products such as scents, watches, cuff links, leather good and other accessories. Founded in 1912, under the name Elmo, their first focus was making nibs, and then they moved to fountain pens in 1920. The founders, Edwige Hoffman and Heidrich Helm sold the company in 1925. In the 1930s the company was aquired by the Aquila family of Italy. But from those days to now, this company is all about Italian style. Giuseppe Aquila, President of Montegrappa is reflective of the company, good looks, a sense of style! When my wife and I met with Giuseppe we received an extensive tour of the Montegrappa operations. World War I, and the location of Bassano del Grappa, all worked to the favour of this company. The company was a source of pens for soldiers in World War I. Noted individuals such as Ernest Hemingway and John Do Passos, were war correspondents, volunteers and ambulance drivers and they both wrote with Elmo pens. For many years the company created truly beautiful and well made pens. 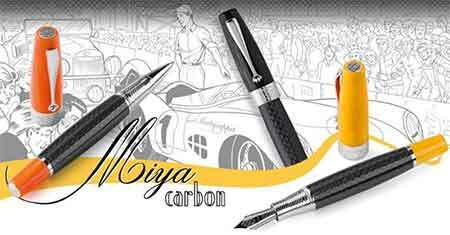 Right: The classic Miya fountain pen has been released with bold colours and a carbon body. In 2000 the company was purchased by the Richemont Group, owners of other luxury pen brands such as Montblanc, Cartier etc. ), and then the company was sold back to the Aquila family in 2009. 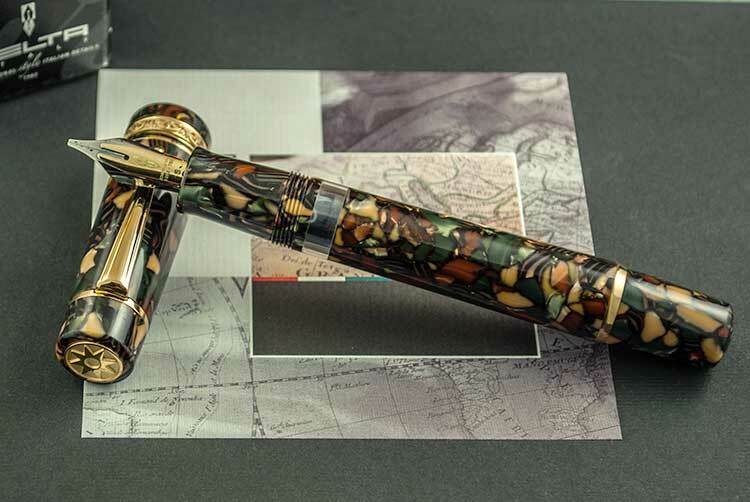 2014 is a significant year for Montegrappa, as to remain current, the company enhanced many of the lines and introduced new pens with colours and materials. 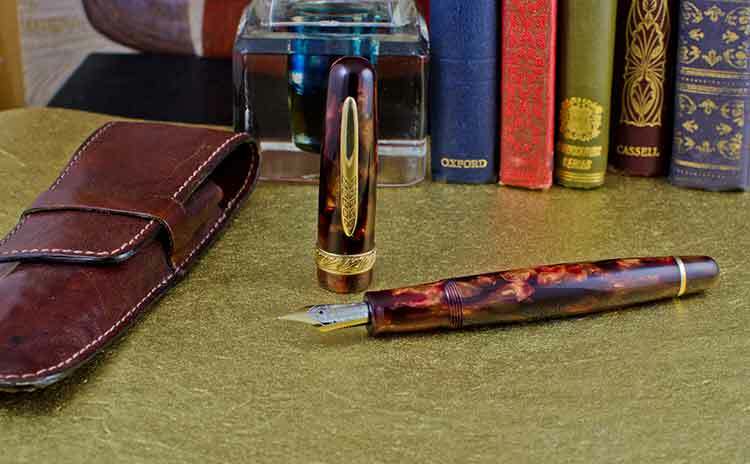 While its core lines are true to the style of pens from its past, Montegrappa is introducing new lines. Also in 2014, the year of the Icons Series will honour Pelè one of the greatest football players the world has seen. In the Icons Series will also be a pen for Ayrton Senna, a famous Grand Prix driver. These are all being created and brought onto the market to appeal to different segments of the market. It may not be the traditional pen collector, but they are attractive looking pens, and with Montegrappa, you know they will be well made. The company is going "edgy" to cross the generational challenges. The Adventurer line will include the Fortuna Skull Pen, which attaches itself to all types of clothing. A Parental Advisory banner will offer pens and accessories with touches of Bling. Get ready for pens engraves with D signs and presented in a box that looks like a stack of $100 bills! In my recent correspondence with Giuseppe Aquila, he notes Montegrappa has been using 18 kt gold for its nibs for more than 102 years. In the past four years, for some of their resin body lines, that have started to use stainless steel nibs. However, gold nibs are still exclusively used for the celluloid and limited edition pens. Giuseppe notes that while the quantity of Limited Editions may have decreased over the past year, the values of the Limited Editions remains high. Well I will lament the end of the Extra 1930 line, a line I was particularly found of and regret I will not be able to add to my collection. 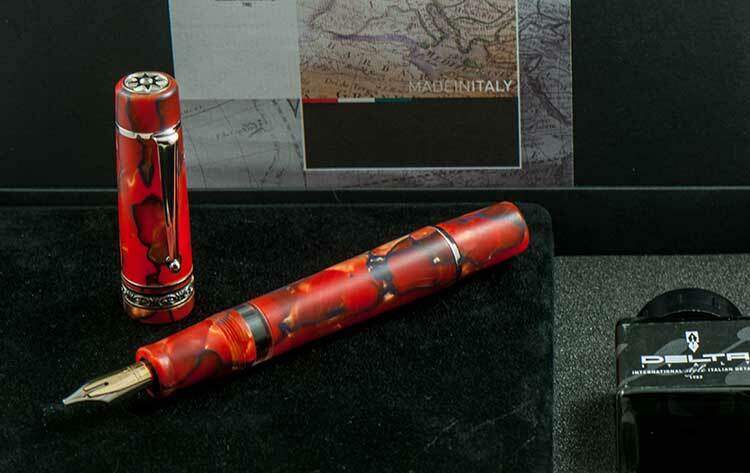 But, that being said, I am always keeping my eye on Montegrappa, and so should you. One can not talk about Italian pens without a reference to OMAS. Their pens are designed in their Bologna workshop and examples of Italian creativity. The company was founded in 1925 by Armando Simoni. The name, OMAS, stands for Officina Meccanica Armando Simoni. They launched the iconic Arte Italiana Collection in 1934, and the Triangular 360 in 1996 - to name two of their most famous lines. OMAS was a family run business until 2000 when it was acquired by LVMH, Lois Vuitton Moet Hennessy. In 2007, OMAS was owned by Hengdeli Group and LVMH Groups. "bringing whoever wants to live the experience of handwriting as a personal enrichment, leaving behind a "sign", to remember precise and pleasant feelings lived in a different moments of our lives..."
For those who own an OMAS fountain pen, the quality of the workmanship that goes into an OMAS pen, the smoothness of the OMAS nibs define the OMAS writing experience. The nibs are made in three variations: 18 kt gold, 14 kt gold or Titanium. Other than Titanium, the nibs are available in twelve sizes, ranging from Extra Fine, Fine, Medium, Broad, Double Broad, four variations of Oblique, Stub, Italic and 52 Degrees. Depending on the retailed, nib styles outside the Fine, Medium, Broad would typically a special order. OMAS pens are made from materials such as cotton resin, celluloid, wood, titanium and silver and gold. I believe OMAS is staying close to its successful roots: concentrating on its iconic brands, and supplement those with the Vintage Edition Collections. 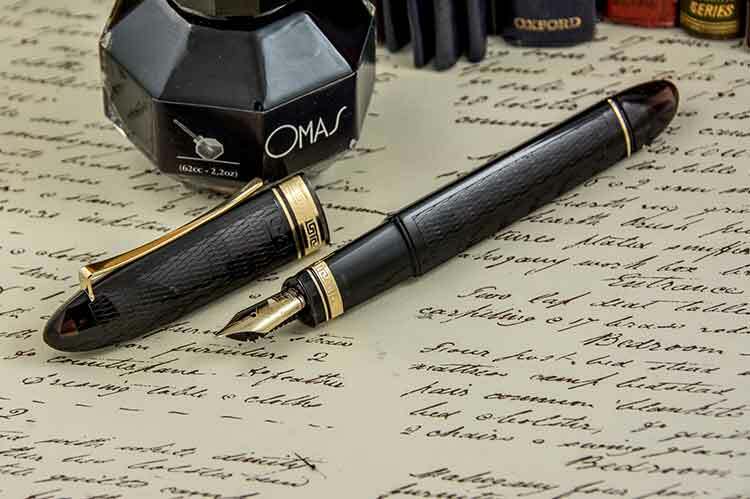 In addition to the regular production lines, OMAS has Numbered Editions which are either Special Editions, typically co-branded, Limited Editions and Masterpieces. OMAS has co-branded with some of the leading names in luxury brands. The Masterpieces are made in very small numbers, typically made of gold, with diamonds and other previous stones. They are really collective pieces of art. When I visited OMAS I was impressed with the degree and amount of workmanship done in their own factory. This is a direction OMAS plans to continue with the focus of doing what they can internally. 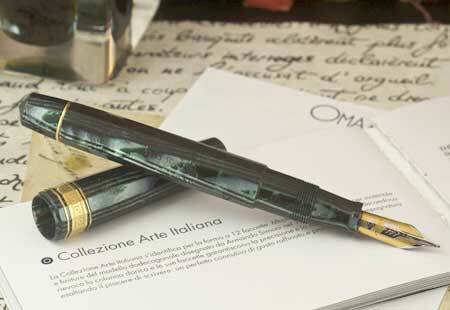 OMAS says it is the last Italian company who manufactures all its fine writing instruments in its workshop in Bologna. Finally, Stipula. Another relatively young pen company. In 1982 Stipula turned to make its own pens rather than making them for other pen companies. The “Stipula” trade name was coined in 1991. In 2005, Etruria acquired the brand name Stipula, but despite this change, the company has always remained a family-owned business. Small in size, with about ten employees, Stipula is a team of individuals who create their own pen designs and produces their lines of pens at their factory in Firenze/Florence. The name “Stipula” alludes to the stipule or “straw” that the ancient Romans were break as a sign of acceptance to an obligation. Stipula usually produces between 50 and 100 pens at a time. Final assembly of the pen is is timed with actual orders. The Italians, a great group of leading manufacturers of pens. Although I did do into detailed about the other companies, there are more pen companies in Italy. Ancora, which dates back to 1920. It closed in 1975 but Giovanni Santini started up the company again in 1988. The company has its headquarters in Pavia. They make small quantities of hand-made pens. Tibaldi was founded in 1916 by Giuseppe Tibaldi. The 1930s being a period of beautiful celluloid pens created by the company. The owner died in 1935. The company changed hands a number of times. It closed in 1965. In the 1990s the brand was revised and acquired by the Aquila Family (Montegrappa). Marlen started in 1982 by Mario and Antoni Esposito in Caserta, not far from Naples. The company focuses on limited-edition pens. Although this is not a brand of pen you may see in your local pen store, Marlen has created some noted pens that include the Summit for Peace, which is one of 15 pens produced and used by Pope Benedict XVI in 2007 as well as the official G8 pen in 2008. Signum was founded in 1979 by Antonio and Fausto Guidolin. Antonio was a previously an long time employee of Montegrappa. The first focus of the company was to make pens for other Italian brands, but it then issued its own brand of Signum pens. Okay, that is a wrap, hey a standing "O"... not bad! At the June 2014 meeting of the Vancouver Pen Club, I gave a talk on the Italians. The great Italian pen companies. I looked forward to this talk as over the past number of years I have visited each of the major pen companies in Italy. Delta was the first to write back and provided good information. We have made arrangements to return to Naples this fall and visit with Delta again. 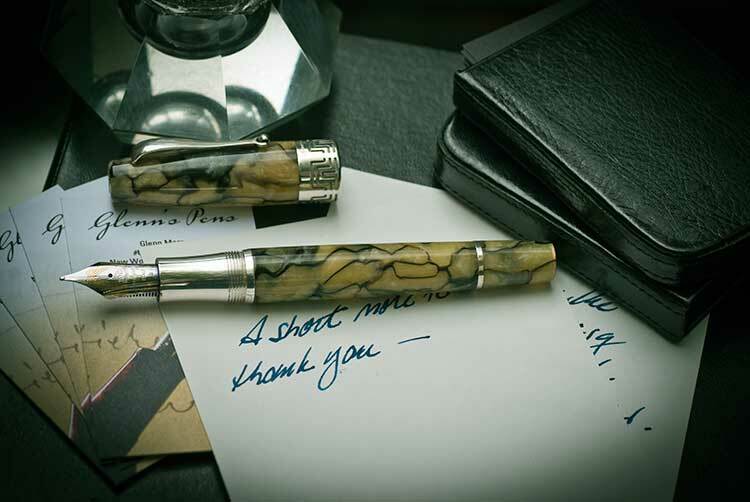 Montegrappa was also quick to follow-up, and President and CEO, Giuseppe Aquila, wrote back and provide information on their current initiatives. It was good to hear from him and Karen and I are going to try to work a return visit to Brasso del Grappa in the next couple of years. OMAS also replied and provided information on their new initiatives.